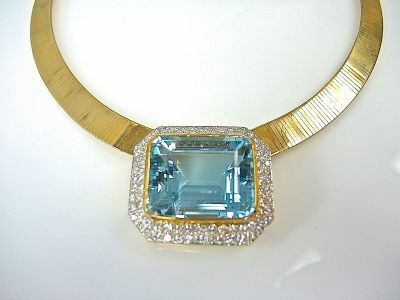 A stunning vintage 14 kt yellow gold Omega motif necklace with 1 emerald cut aquamarine, est. 72.19ct. and 84 round brilliant cut diamonds, est.3.68ct. (clarity:SI clarity & H-I colour). Please make an appointment to see this stunning aquamarine necklace.